Hello, thanks for stopping by my webpage, the online presence for Saurian Enterprises! I’ve been working with reptiles and amphibians since the early nineties, and over that time I’ve bred well over 100 species of these amazing creatures. Over the twenty plus years I’ve been in business, I’ve helped hundreds of hobbyists get started in the hobby of frog keeping. I’ve also sold frogs and supplies to dozens of zoos and institutions. During the period from around 2000 to 2010 or so we were probably the first or second largest breeders of dart frogs in the US. However in 2012 I moved and significantly downsized. Now, in 2018, the interest and passion remain, although on a somewhat smaller scale! Today I am working with a select group of dart frogs, a few tree frogs, as well as some frogs that don’t really fall into either category. There are also a few lizard species in the collection, and the offspring of these will show up regularly on the site. I’ve also got a modest selection of drygoods, including fruit fly culturing supplies and cultures, terrarium plants, and assorted terrarium supplies. 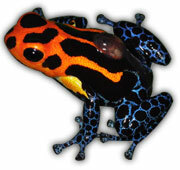 Browse the site, you’ll find lots of detailed info on keeping dartfrogs, as well as other frogs. Please feel free to reach out and contact me if you have any questions, I look forward to working with you!